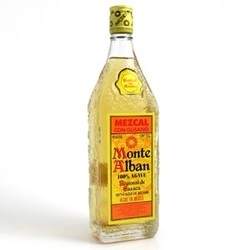 "The original Monte Alban Mezcal contains a specimen of the famous worm that inhabits the agave plant. It is actually the larva of one of two moths. There is some mystery surrounding the purpose of this worm ..."
I'll stop the quote there. There's no mystery about the purpose of the worm - my only question is why such a thin bottle with such a fat worm that is so hard to get out, especially given the state you're in after having finished the bottle?
" Its pronounced nose of smokey oak and dust is reminiscent of a sweaty saloon bar ashtray, and evokes the faces of villains from one of Clint Eastwood’s spaghetti westerns. The pungent nose carries on to the full-bodied palate that is tempered by the slightly sweet and spicy wood characters. Finishes with a big spirit hit and a long warming aftertaste. Sip neat or enjoy in the conventional way with salt and fresh lime juice: a small amount of salt tongue, followed by Mezcal and only then – lime juice. 40% alc./vol. However one decides to enjoy Monte Alban, we do not recommend it for the faint hearted." "Sweaty saloon bar ashtray", eh? And this is from the people who PRODUCE it. How would an enemy describe it?